In honor of the fifth anniversary of Voices from the Margins, I am sharing one of the first posts I wrote about a life-changing choice I made many years ago to tackle an emotionally laden issue. The essay was originally posted on a blog I shared with the friend who taught me the ins and outs of blogging in 2013 and was reposted here along with other essays when this blog was started on February 12, 2014. 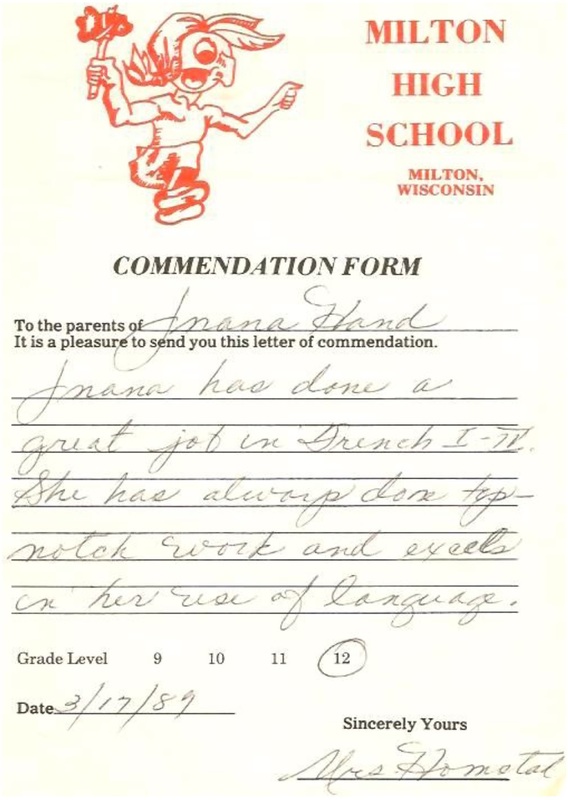 More than two decades ago, when my daughter was a senior in high school, she received a commendation notice from her French teacher. This was not the first or last, but it was the one I noticed on a different level. I remember “seeing red” when I noticed the logo on the top, yet I immediately reflected on the message – my daughter had demonstrated excellent work. So I complemented her. Then, I contacted the Wisconsin Department of Public Instruction (WDPI) to explore what protections they had in place to prevent racial stereotyping of indigenous peoples. The response from WDPI changed my life. At the time, I was working on a federal grant to address elder abuse in eight pilot counties in Wisconsin. In an effort to promote awareness about the project, I met with a reporter from a local paper. In the process of talking about the project, “Tools of the Trade for Men Who Care,” the reporter and I became friends. We were both outsiders in the largely white, Christian community. She was Jewish, and I was Ojibwe. I mentioned the appalling name and logo used by the local high school, and mentioned that I had been advised by WDPI to wait until my daughter graduated to pursue any action. But, I was told, there was a state statute, The Pupil Nondiscrimination Act that I could use as the basis of a complaint. The WPDI staff added that although the statute had never been tested for its relevance to discriminatory logos and team names, filing a complaint under this statute could set an important precedent. My friend asked me to let her know if I ever decided to pursue the issue. Second, I expected a thoughtful diplomatic response from the superintendent of schools. If one believes the physics theory that every action results in an equal and opposite reaction, a well-reasoned letter calling attention to unintentional discrimination toward Native Americans should result in the willingness to dialogue, right? That was not the case. The response of the superintendent was to send a copy of my letter to the weekly newspaper in the local community. My friend also broke the story in a larger newspaper on a slow news day. Within a week, I was the topic of hundreds of letters to the editor in local and state newspapers, and featured on the nightly TV news. The community reaction included nasty, degrading personal attacks and threats. I presented my case to the group, and angry community members responded by voicing three recurring arguments: “we’re honoring Indians” (so shut up and be honored); “other schools and national teams do it” (so it’s okay); and “we’ve always done it this way” (so the history of denigrating others and exploiting their cultures makes it acceptable to continue, even when presented with evidence that it causes lasting harm). The most interesting observation voiced by community members – “If we call our team the Red Hawks, the ASPCA will complain about discrimination.” Only one person at the meeting spoke in my defense, a minister who was new to the community. He stated that the entire scene at the meeting reminded him of the civil rights struggles in the South during the 1960s. He added that my position was reasonable, and he was aware that by saying so, he was likely to experience backlash from the community. It was obvious from this meeting that change would not come willingly from the community. Other change strategies would be necessary if I decided to pursue the issue. So, I undertook a number of exploratory steps. Two brave teachers at the elementary school invited me to speak to 4th and 5th grade classes. My friend from the newspaper came with me, and published an article that highlighted the thoughtful and respectful comments and questions that students voiced. The law I was testing required that I deliver a formal complaint to the Principal in person, which meant I had to march into the high school to his office. Two Native friends, both large Indian men, volunteered to go with me. The office was abuzz with activity when they saw us arrive to deliver the complaint. And so began the next phase of what had become both a campaign and a contest. Because it was clear that the local community was resistant to any change, I decided to take the campaign and contest to a state level. I presented my case to the Inter-Tribal Council comprised of leaders from Wisconsin’s 11 tribes and gained their support. I contacted statewide groups that supported treaty rights and gained their endorsement as well. I put together press packets and met with editorial boards for my friend’s newspaper and the most prominent state newspaper, gaining support from both. And I approached a supportive legislator who agreed to present a bill to the WI legislature to address the use of American Indians in the 60-90 school districts in the state that were then using American Indian names and logos for their sports teams. The local school district chose to fight the complaint, using educational monies to pay the school district’s attorney thousands of dollars to defend continuing discrimination. The school’s attorney and I were summoned to meet with the Chief Legal Counsel for the WDPI to argue the case. My friend from the law department came with me as support, although I knew that it was my role to serve as the primary speaker on the issue. As the meeting began, it was clear that the Chief Legal Counsel was leaning toward the district’s position. The district’s attorney launched into a loud tirade about how stupid my complaint was, arguing that it was not a proper legal document and my concerns were pointless and silly. I remained calm and focused, and when the attorney finally was silenced by the Chief Counsel, I quietly replied. “I know that I am not a lawyer. But I do know that I am a good writer and I have presented the issue in clear English.” At that point, a major shift occurred. The Chief Counsel looked at me and replied “I, for one, would appreciate hearing a clear explanation of the issues. Please take us through your complaint.” At that point, he became a behind-the-scenes ally. We later found ourselves as co-defendants in court when the school district filed a motion to stop my complaint from moving forward. I was able to secure representation from ACLU, but the district prevailed. The judge ruled that I was barred from moving forward with the complaint. The district celebrated by sending the school band to march in front of my house playing the national anthem and other patriotic songs. The outcome for the community took time, but it was the best resolution. Ten years later, the students themselves advocated to change the name and logo for their sports team – to the Red Hawks. (I doubt that the ASPCA will ever file a complaint.) And every session, my friend in the legislature continued to introduce his legislation to discourage the use of American Indians as names and mascots. It took 20 years for the bill to be enacted. In the interim, he placed a state map with black pins depicting districts with Indian logos and pink pins to denote districts that voluntarily changed to other names and logos as a result of increasing awareness. Many hundreds of friends and allies helped me raise awareness before, during, and after my involvement. In some settings, my voice was perhaps the most effective, and sometimes, others were the most effective advocates. I learned that it is not who serves as the lead spokesperson that matters. What matters is contributing what one can in the ongoing challenge of creating a community, state, nation, and world that promotes inclusion and respect for differences. It is sometimes hard to look back on those years without thinking I should be doing more. Still, at this point in my life, it feels far more appropriate to serve in a less visible way, teaching, encouraging, and supporting younger people behind the scenes. There’s much that can only be learned through the experience of taking on issues that light a fire in one’s heart to create a world that could be. The local school district chose to fight the complaint, using educational monies to pay the school district’s attorney thousands of dollars to defend continuing discrimination. The school’s attorney and I were summoned to meet with the Chief Legal Counsel for the WDPI to argue the case. My friend from the law department came with me as support, although I knew that it was my role to serve as the primary speaker on the issue. As the meeting began, it was clear that the Chief Legal Counsel was leaning toward the district’s position. The district’s attorney launched into a loud tirade about how stupid my complaint was, arguing that it was not a proper legal document and my concerns were pointless and silly. I remained calm and focused, and when the attorney finally was silenced by the Chief Counsel, I quietly replied. “I know that I am not a lawyer. But I do know that I am a good writer and I have presented the issue in clear English.” At that point, a major shift occurred. The Chief Counsel looked at me and replied “I, for one, would appreciate hearing a clear explanation of the issues. Please take us through your complaint.” At that point, he became a behind-the-scenes ally. We later found ourselves as co-defendants in court when the school district filed a motion to stop my complaint from moving forward. I was able to secure representation from ACLU, but the district prevailed. The judge ruled that I was barred from moving forward with the complaint. The district celebrated by sending the school band to march in front of my house playing the national anthem and other patriotic songs.